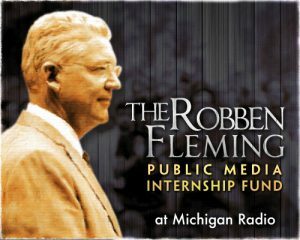 Michigan Radio has received a gift from donor Thomas C. Jones to establish the Robben Fleming Public Media Internship Fund. The $200,000 gift will provide a dollar-for-dollar match to inspire other individuals to contribute to a fund offering paid internships to college students working in Michigan Radio’s newsroom, on its Stateside talk show, and in the online news and operations areas. Jones is an alumnus of the University of Michigan, a graduate of the Stephen M. Ross Business School (’68 BBA, ’71 MBA) and serves on various volunteer committees and boards at the University. Michigan Radio’s internship provides a real world opportunity for journalism training at Michigan’s leading NPR news station. Interns receive hands on training in all areas of Michigan Radio’s news operation, including the station’s daily Stateside talk show. Many of Michigan Radio’s past interns have gone on to permanent positions with National Public Radio, local public radio stations and other news organizations across the country, as well as Michigan Radio itself. Zoe Clark, Michigan Radio’s interim Program Director, began her public radio career as a station intern while attending the University of Michigan. In January, 2016, Michigan Radio began providing paid compensation to interns in order to increase diversity among program applicants and better reflect the demographics of the communities that Michigan Radio serves. With an unpaid internship program, often only those students able to work without pay would apply. Jones’ gift significantly supplements internal station funds already committed to the program. The internship fund is named for Robben Fleming, who served as president of the University of Michigan from 1968 to 1978. Jones chose to honor Fleming’s strong campus leadership during the turbulent 60’s and 70’s when Jones was a U-M student himself. Following his tenure at U-M, Fleming served as President of the Corporation for Public Broadcasting Foundation from 1979 to 1981. For more information on the Robben Fleming Public Media Internship Fund, contact Director of Development Larry Jonas at (734) 763-3416 or by email at ljonas@umich.edu. You can also make your gift online here. Internship openings, when available, can be found on Michigan Radio’s jobs page. Michigan Radio is the state’s most listened-to public radio station, attracting approximately 500,000 listeners each week across the southern half of Michigan’s Lower Peninsula. Michigan Radio broadcasts at 91.7 FM in southeastern Michigan, 91.1 FM in Flint, and 104.1 FM in western Michigan, and is available online at michiganradio.org. Yet he also won plaudits from antiwar students and faculty alike for calling the U.S. intervention in Vietnam “a colossal mistake.” His temperate influence was seen as critical to U-M’s passage through that era without the violence that marred other major campuses. Fleming’s most difficult moment was the 12-day BAM strike in 1970, when intimidation and threats of outright violence by the Students for a Democratic Society accompanied a boycott of classes to demand larger numbers of African-American students and faculty. Herbert W. Hildebrandt, professor emeritus of business administration and communication studies, served under Fleming as vice president and university secretary. He recalled Fleming’s steadiness when, during a tense Easter weekend, he met for long hours of negotiations with angry student leaders. The conflict was resolved without violence when the administration promised to provide financial aid sufficient to raise the level of African-American enrollment to 10 percent of the student body. The Fleming era also saw major initiatives that advanced U-M’s standing as a global research powerhouse and augmented offerings to students. These included the founding of the Residential College and the expansion of UM-Flint and UM-Dearborn into four-year programs. Fleming presided over the university’s first concerted efforts to curb unfairness in the treatment of women and minority groups among faculty and students. And when, in a stagnating economy, state appropriations to higher education began to decline in the 1970s — a challenge that would dog his successors to the present day — he sought to uphold high academic standards amid unavoidable cutbacks. Fleming stepped down as president to serve a two-year stint, from 1979-81, as chairman of the Corporation for Public Broadcasting, the federal funding source for National Public Radio and the Public Broadcasting System. There, his key achievement was to help arrange an epochal grant of $150 million for educational television programming from the philanthropist Walter Annenberg. After returning to Ann Arbor for semi-retirement, he taught one course each year in the law school, then was tapped as interim president in 1988. In that role, he helped the university weather several widely publicized racial incidents, paving the way for the significant expansion of multicultural programs that followed in the 1990s. Born and raised in the small town of Paw Paw, Ill., Fleming graduated Phi Beta Kappa in 1938 from Beloit College, where he was student body president and captain of the basketball team. At Beloit he met Aldyth Louise Quixley, known as Sally. The two married in 1942 and had three children. After earning a law degree at the University of Wisconsin, Fleming worked briefly for the U.S. Securities and Exchange Commission, then as a mediator for the War Labor Board, his first experience in the resolution of labor disputes. During World War II, he joined the Army, rising in rank from private to captain and serving in North Africa and Europe. After the war, his labor work led to his appointment as director of the Industrial Relations Center of the University of Wisconsin, then to a similar post as director of the Institute of Labor and Industrial Relations at the University of Illinois, where he took a joint appointment as professor of law in 1958. Meanwhile, he gained a national reputation as an authority on labor-management relations and as a working arbitrator. His prowess in settling workplace disputes led to the publication of a series of books and articles on the subject. It also attracted the interest of University of Wisconsin leaders who, in 1964, were looking for a conciliatory new chancellor as student protests began to stir. 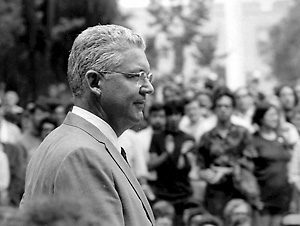 As chancellor of Wisconsin’s main campus in Madison, Fleming in 1967 did not want students arrested in a building takeover to become martyrs to their cause, so he wrote a personal check for $1,470 to bail them out of jail. He was named to the Michigan post only a few months later. Philip Power, a former U-M Regent, said Fleming’s understanding of human progress led him to embrace the possibilities inherent in clashes that might have unnerved other leaders.